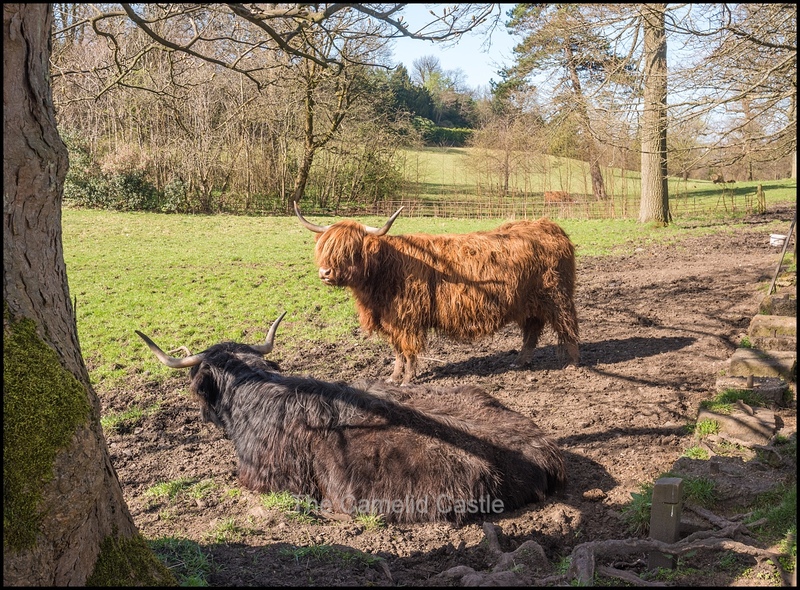 Our week in Glasgow was coming to an end, but first we had a visit to Pollok Country Park for some beautiful gardens and hairy coo (yes those very Scottish cows!). Once Anto escaped work we jumped in the car and headed North out of the city, the start of our Scottish wanderings that would take us through the highlands. Our first stop of Pitlochry in Perthshire meant a visit to the Highland Chocolatier and Dewar’s whiskey brewery. After getting to bed near midnight post packing, Anto had a 6am start to head out to the airport and swap the work car for our personal hire car for the highlands portion of the trip, and get back into the city to beat the crazy traffic. Luckily the kids managed to sleep until closer to 7.30am but still not late enough for the long day ahead! We all had breakfast in the apartment using up left overs and our bags were packed into the car and we bid farewell to our Glasgow apartment. 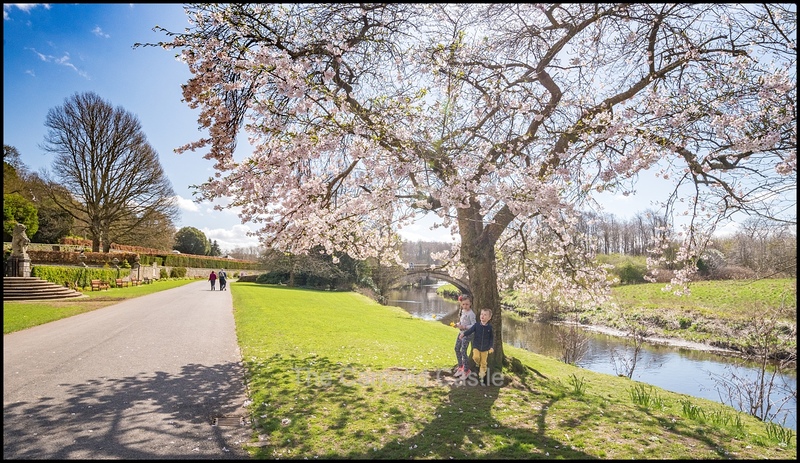 Anto dropped the kids and I at Pollok Country Park on his way to meetings, although the traffic getting out of the inner city was predictably annoying! Pollok Country Park is a 146-hectare country park located in Pollok, south Glasgow. 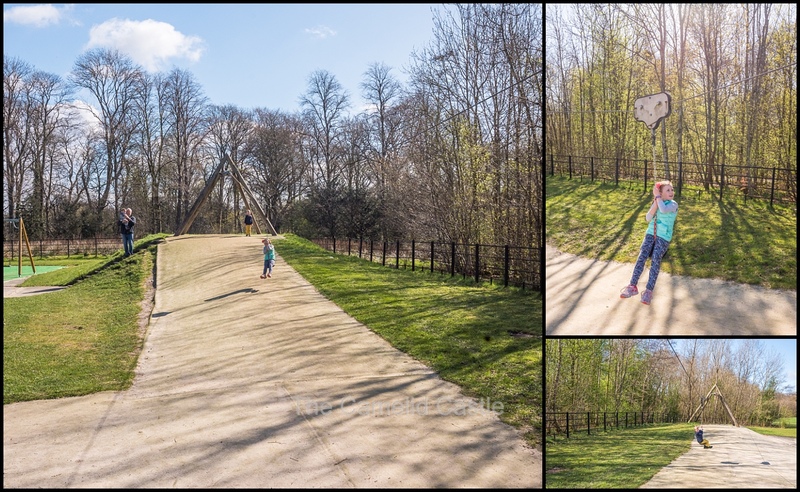 The park is only a few miles from the inner city but feels like it is in the middle of nowhere despite the surrounding streets being full of shops and high rise apartments! You really do feel like you are out in the country. On the drive into the park we spotted some Highland cattle, so the kids voted Anto drop us off so we could have pats. We bid him farewell and sent him off to meetings while we communed with our first hairy coo of the trip. 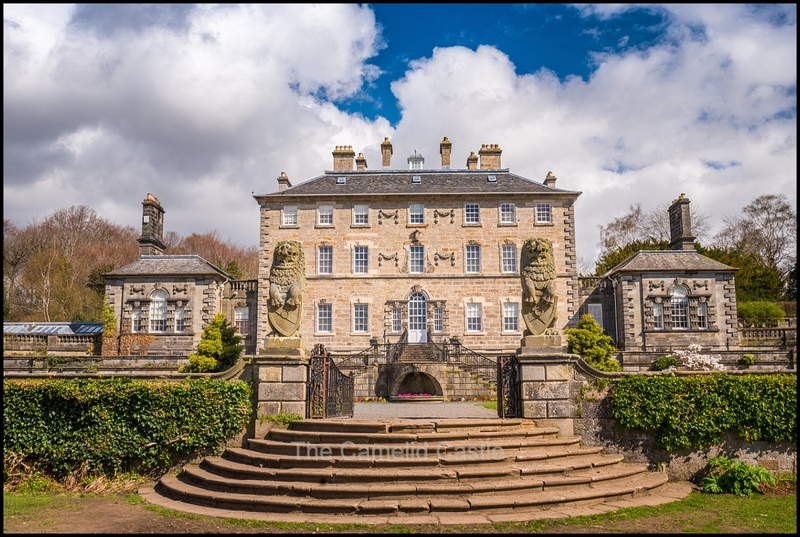 The park was originally part of the Old Pollok Estate, which was home to the Maxwell family for over 700 years. 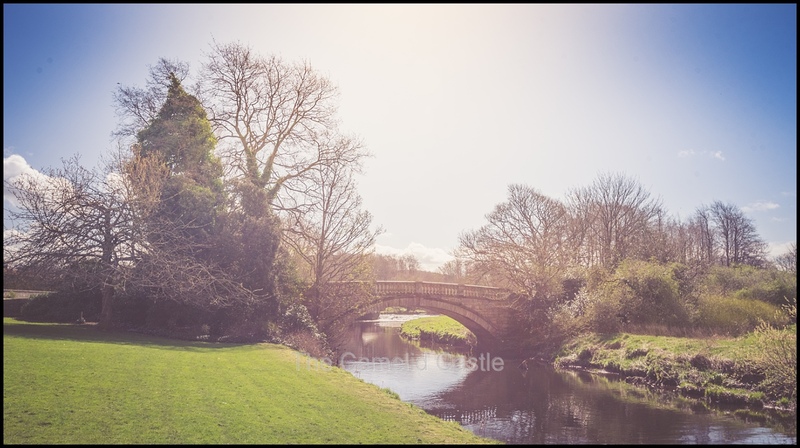 In 1966 Mrs Anne Maxwell Macdonald gifted the estate, including Pollok House, to Glasgow Corporation with the condition that it remained a public park. It was named the best park in Britain’in 2006 and in 2008, it was named the Best Park in Europe. 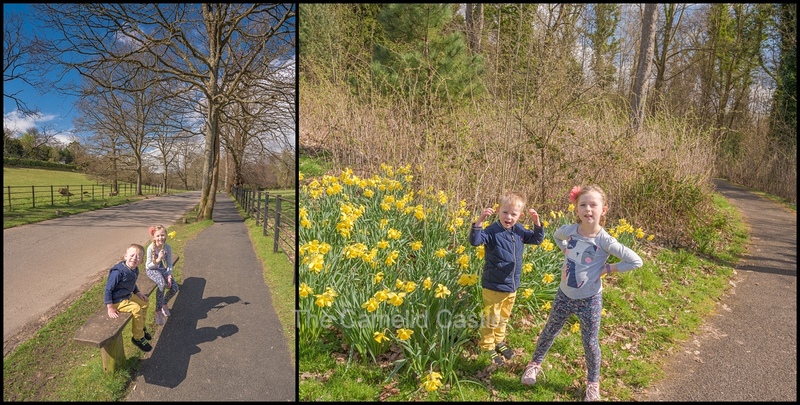 I had to tear the kids away from the cows but we thought we should explore a little more of the park before it was time to head out of Glasgow. It was a beautiful Spring day and there was green grass and flowers everywhere. Pretty soon the kids spotted the play area. It was a good-sized playground and the kids happily played for an hour in the sunshine. Our puffer vests were quickly off as it was 14 degrees with no wind. They loved the flying fox but there were good swings, seesaws and trampolines. The park was large and we had a lot to explore in a few hours, so I had to drag them away….. with a lot of protest! We walked back towards the cows, past many daffodils and paddocks. The kids were collecting broken off daffodils and having a wonderful time. Unfortunately the cows had moved and were no longer where we could see or pat them, but we did find a squirrel in the deer park, but alas no deer! We walked up past Pollok House. There were plenty of woodland trails surrounding Pollok House and we walked a short distance on some of them. One went past what looked like a fair being set up but we suspect it was a film/TV set. It was attracting a crowd of onlookers. After a wander through some of the trails it was back to Pollok house to explore some of its gardens. The house backed onto the river so we walked along the river and admired the beautiful blossom trees in full bloom and a nice stone bridge over the river. There was a large golf course on the other side of the river but we stuck to the Pollok House side. After a walk down the river we went for a wander through the Pollok House gardens, which are to lovely English style walled gardens, with hedge mazes, flowers everywhere and green lawns. The kids had a wonderful time running through the hedges and playing with their flowers on the lawns. We were now getting a bit hungry so decided to eat at the Pollok House cafe. It was still lovely Spring weather so we sat outside. 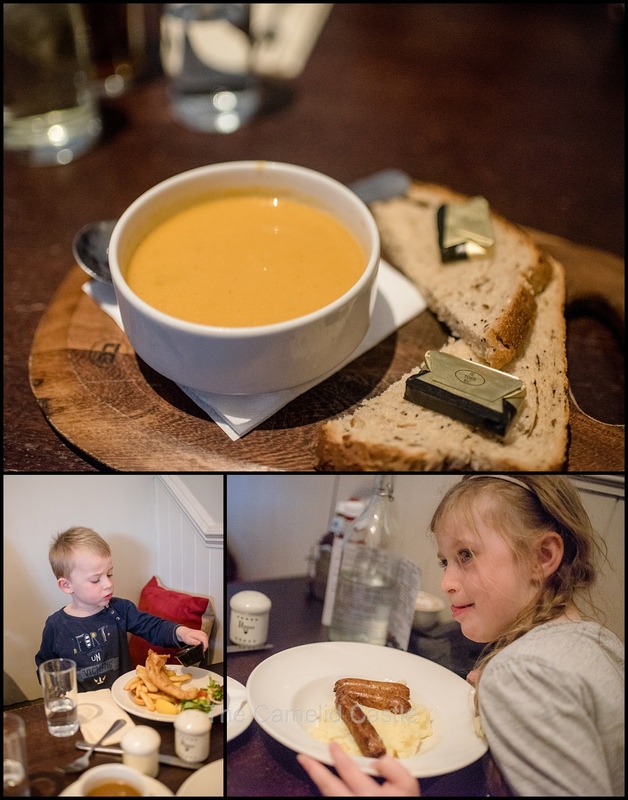 The kids were both over-tired and wanted to argue and debate what we were ordering for seemingly hours, but ended up sharing a kids meal of soup for Astrid (cream of mushroom) and a ham sandwich for Soren. I also got them a lemon and earl grey cake for dessert which was amazing (and I should have snaffled for myself). I had a cauliflower ‘steak’ with aioli and flatbread. 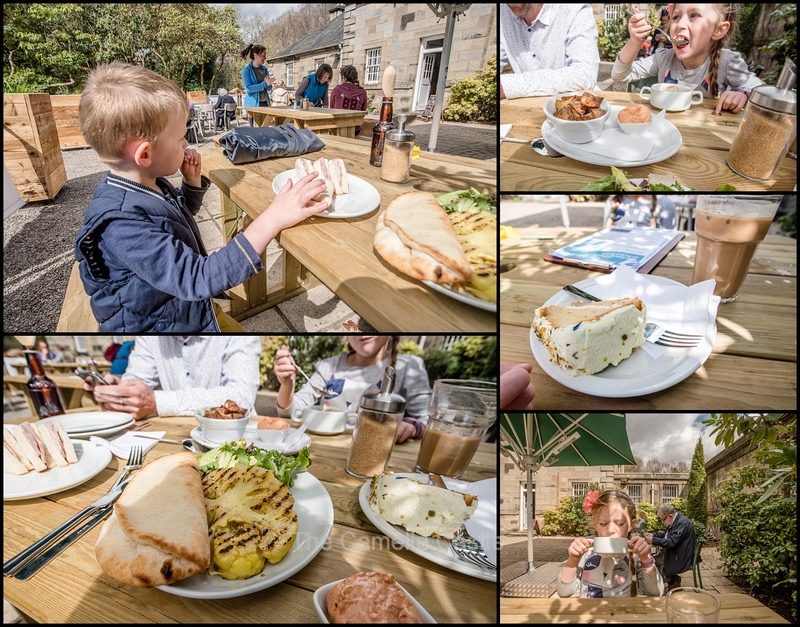 When Anto finally escaped work and found a park he joined us for a cheddar and chutney sandwich. All tired we decided we’d better make a getaway out of Glasgow before the afternoon traffic got worse. Being Friday, the peak hour was predicted to start early. 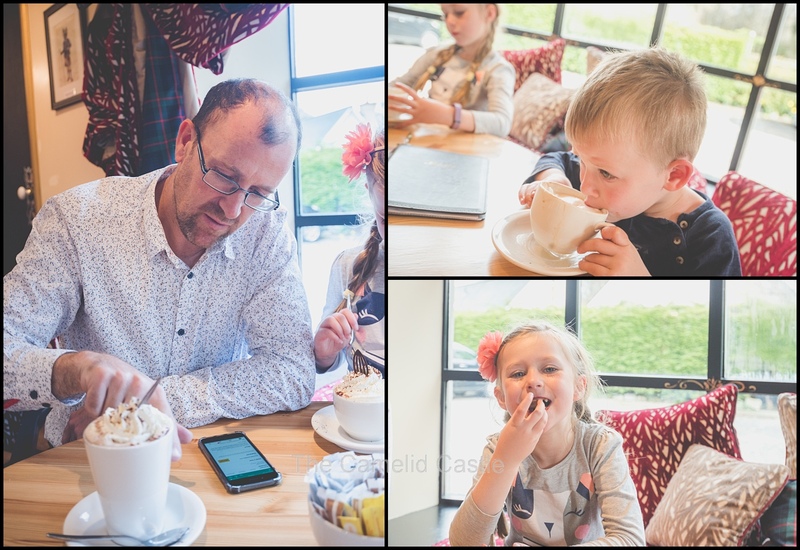 We manged to get back out of the city quicker than the day before when we drove to Stirling to meet Jamie and his family. Again today we were on the motorway towards Stirling but this time kept going through to Perth. Our plan was to stay near Pitlochry in Perthshire for the night. The countryside is beautiful just outside Glasgow. We were immediately cruising past bright green grass, hills and lots of sheep with lambs. We could still see mountains with snow on top in the distance despite the quite warm temperatures. We arrived in Pitlochry by 3.30pm and checked into our cute little room at the Red Brolly Inn. The hotel is small and quaint and we were shown our room on the top floor through the winding corridors. We decided to book in for dinner at the Inn to save driving into town. With a little time left in our afternoon we decided to pay a visit to the Highland Chocolatier that Jamie had recommended. It would be a shame not to make time to visit a chocolatier! 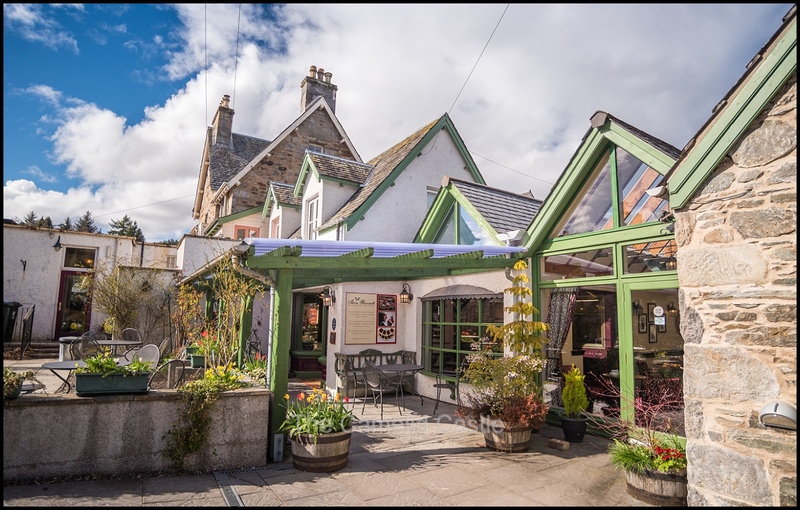 The Highland Chocolatier was about a 7 minute drive away through more rolling hills and past paddocks filled with sheep and lambs. The Highland Chocolatier is another cute building. The tea room was lovely with tartan and beautiful pictures. It wasn’t long until closing time so we had the place almost to ourselves. After filling our tummies with chocolate we had a look at the chocolate making area and the gift shop but we were still carrying a quantity of chocolate purchased in Belgium at the start of the trip so we resisted buying more chocolates despite them looking yummy! Next it was off to Dewar’s distillery. There are plenty of distilleries in the area and Anto is a fan of scotch so we figured we’d visit some. We were too late for any of the tours of nearby distilleries (and most don’t allow kids). 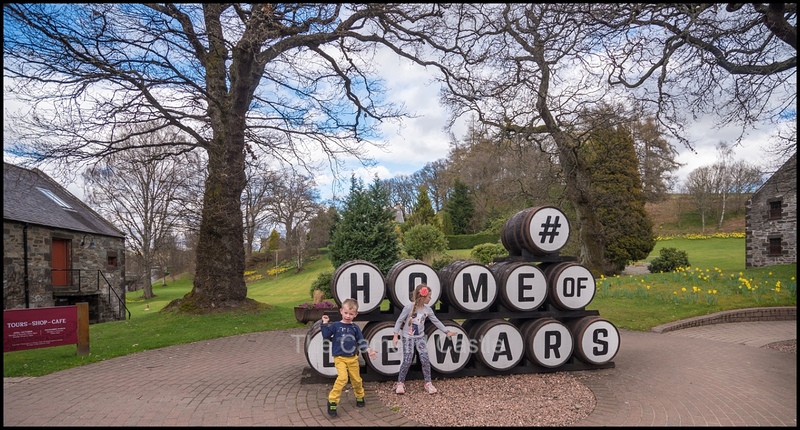 The building surrounding Dewar’s are lovely so we enjoyed a little look around and kids managed to not break anything in the showroom. Anto made a couple of purchases of things he can’t get back home. It was now almost 5.30pm so we decided back to the hotel. 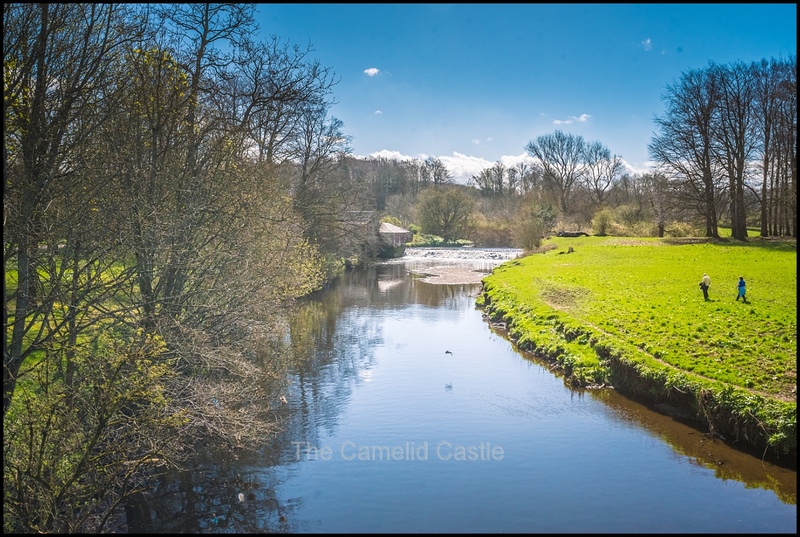 Our drive took us past more green fields, running streams, cute villages and many fields of sheep…….. and lots of pheasants, many squished on the roads! We were exceedingly glad we’d booked the hotel restaurant for 6pm since we were all tired. Despite the menu not being that exciting the food was very good. After some effort we talked Astrid down to the 2 course kids meal rather than 3, which was good as they were huge meals. She had bangers and mash with gravy and Soren had the fish and chips with salad. All the serves were not exactly kid-sized and were rather enormous (and reportedly tasty). I was full, after eating most of the day, so had the starter of carrot soup and bread. 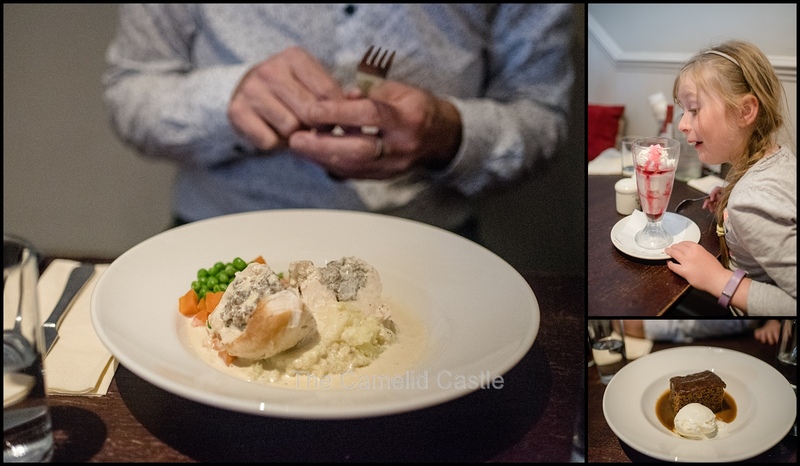 Anto had chicken stuffed with haggis with mash, and cream sauce and a local beer. We then shared a sticky toffee pudding and the kids had a strawberry sundae as part of their kid’s meal. Again the sundaes were enormous. All full of food we waddled back upstairs to our room. This far into April it was getting dark quite late but we convinced the kids it was well and truly sleep time despite it still being light well after 8pm. At this point we were very glad we’d stayed up late the night before packing individual bags for the next few days so we didn’t have to unpack the car every night and could just take in one bag at a time. For most of the Highlands portion of the trip we were moving every day so we’d tried to plan ahead as best we could with packing. The next day we were farewelling Pitlochry and heading further North towards Inverness. Daily statistics for Friday the 20th of April in Glasgow and Pitlochry, Scotland – the temperature range for Glasgow was a pleasant 7 to 16 degrees and sunny. We’d really lucked out with our Glasgow weather for the week! 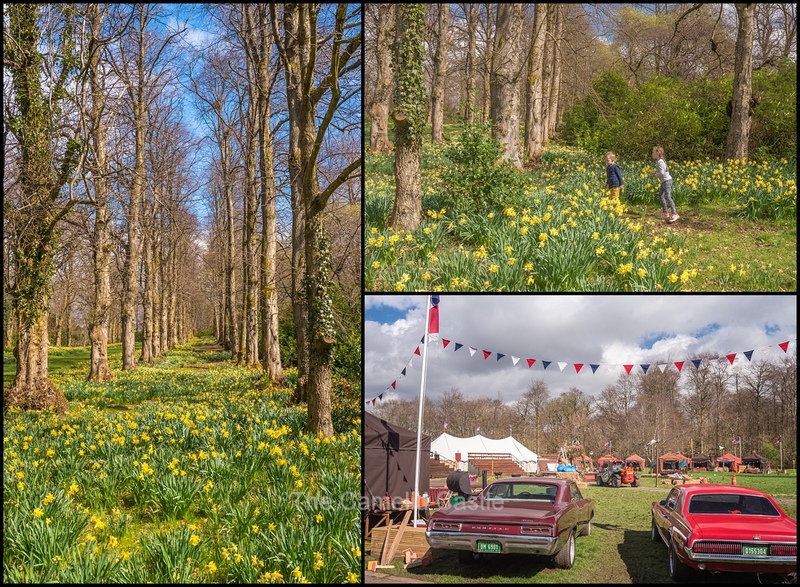 Our afternoon in Perthshire also had pleasant Spring-time temperatures with it reaching a lovely 15 degrees. The total walking for the day was 7.8km, mostly in the morning around Pollok Park, as we spent most of the afternoon driving. Our driving adventures for the day took us from Glasgow city, north up to Pitlochry. We covered approximately 120 miles (193 km) or a little under 3 hours of driving time. Up next – a driving adventure through Rannoch Moor and up to Loch Ness to search for Nessie before a beautiful Spring afternoon in Inverness. 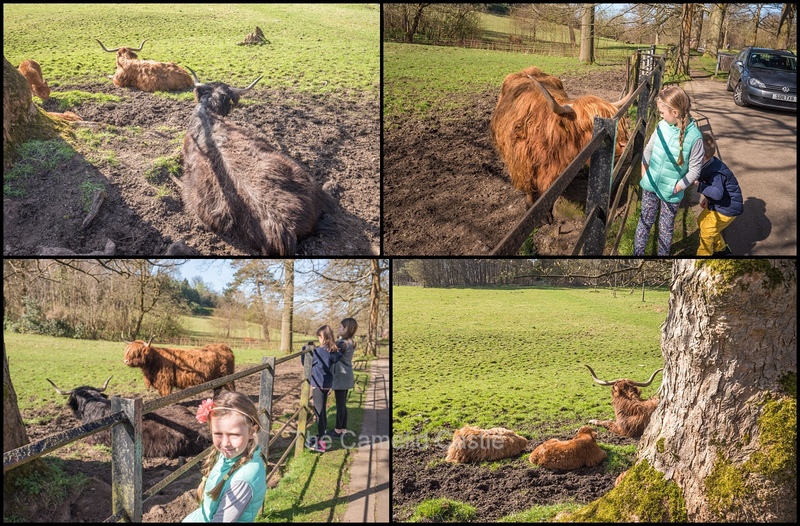 Posted in 4 years, 6 years, Anto, Astrid, chocolate, Glasgow, HIghland Chocolatier, HIghland Cow, Highlands, kids, Park, Pitlochry, Pollok Country Park, Scotland, Scottish HIghlands, Soren, Spring, Travel, travelling with kids, UKBookmark the permalink.